ONLY two nights before John Bangsund rang me to tell me the sad news, Jack Williamson and his wife were guests at our house. After dinner we all enjoyed the usual hate session, and the ears of sundry publishers, literary agents and editors must have burned. But there was one editor about whom none of us could say any ill. We all of us knew him, all of us admired him. 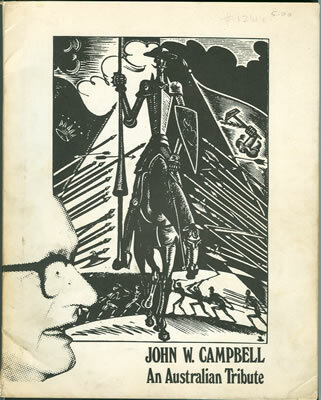 I first met John Campbell in 1942. After the entry of the USA into the Second World War, the ships of the Shaw Savill Line, in whose employ I then was, strayed from their old-established UK-Australasia tramlines and visited what were to us exotic ports. New York was one of these. As a faithful reader, of many years’ standing, of John Campbell’s Astounding, I thought I would take the opportunity of meeting the Great Man Himself. He received me with the courtesy that was an integral part of his make-up. He suggested that I might, like to try my hand at writing for his magazine, I thought be must be joking, but he insisted. So the next time I was in New York I called round at his office with a 4000-word manuscript. - “This means war” - which it had taken rue all of a fortnight painfully to peck out. I said, ‘I suppose I should leave return postage with it...’ He assured me, ‘Don’t worry - I’ll send it back!’ But he didn’t. He sent a cheque instead. One of the records - and one of John’s favourites - was of a male voice choir rendition of “Waltzing Matilda”. For some reason he would always insist that I add my own voice to this one. I never dreamt that the day would come when, sailing under the Australian flag, I should come to think of “Matilda” as my own national song. Yes, those were good patties, and John was an excellent host. The talk was always stimulating and, usually, productive. 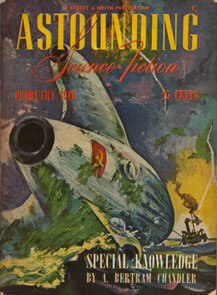 I say usually, because there was one publishing venture discussed that never got past the discussion stage: John, George O. Smith, Theodore Sturgeon arid I worked out all the details of a new magazine, a joint undertaking, to be called “Dirty Stories”. It is many years since I last saw John. We exchanged occasional letters. I wish now that I had kept his. In 1967 my wife visited the USA, and I insisted that when in New York she should meet John Campbell. She did so, and was greatly impressed. She said, admiringly, “He’s the only man who has ever been able to talk me into a corner.” John could talk. He could have been an outstanding school-teacher. He could make anything simple - in fact his very important wartime job was the writing of textbooks on complicated electronic devices for the US armed forces. He could have been an outstanding school-teacher? But he was just that. Every writer who ever worked for him learnt much from him. He was a perfectionist. If he wanted a story, and if it fell short of his standards, he would say. Take it away and do so-and-so and such-and-such; this is your story, your idea and I want It from you The end result of all the rewriting was always worthwhile. In the Carboniferous Epoch we were promised abundance for all. But, though we had plenty of money, there was nothing our money could buy. In my younger days I admired Kipling as a craftsman but did not much care for his ideology. Now I tend to come round to his point of view. In so far as John Campbell was concerned, the Paddington-literary -gent part of my make-up rather deplored his editorials, but the conservative shipmaster was apt to applaud each and every one. But I am talking about Campbell, not Kipling, and certainly not about myself. One last anecdote and I will finish. George O. Smith said to me once, “The trouble with John Campbell is that he has no redeeming vices”. I wouldn’t go quite as far as that myself, but I can and will say that John, in all and any senses of the words, was a good man.